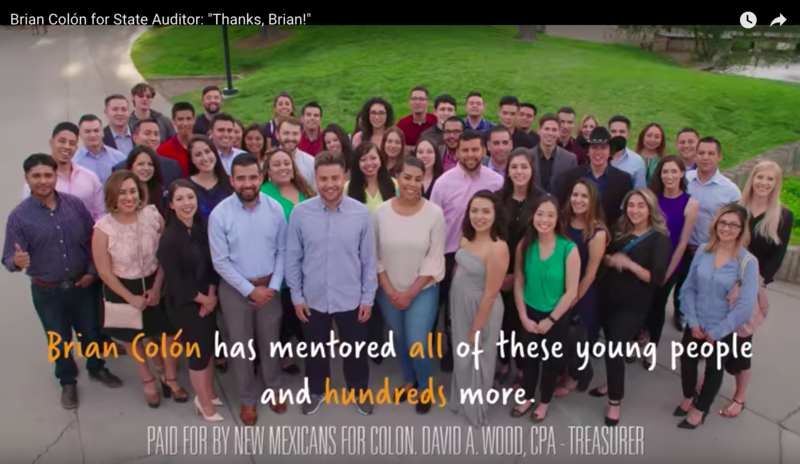 This television ad features many young people stating why they think Colón should be State Auditor. At the end, they state that they think Colón will invest in New Mexico because he has invested in them by mentoring hundreds of young people. Brian S. Colón won the Democratic primary election for State Auditor against Bill McCamley. He is now running in the general election against incumbent Wayne Johnson. Brian S. Colón was elected Chairman of the Democratic Party of New Mexico in 2008. He was the Democratic candidate for lieutenant governor of New Mexico in 2010, and recently ran for Mayor of the City of Albuquerque. Brian Colón has raised $189.4K since 2017. He has spent more than $169K and has more than $20K cash on hand. Colón's top donor is Nestor Romero, owner of The Payroll Company in Albuquerque, NM. In 2018 he has given $11,000 to Colón's campaign. Many of his other top contributors include business owners in Albuquerque.